Select a large container or a part of your existing herb garden. Either method for a tea garden is fine, as long as it is convenient for you. Prepare the soil or pot. Prepare the soil or pot as you would do normally for planting herbs or flowers. Lavender - a delightful, softly fragrant tisane that is perfect for soothing, especially recommended for reducing tension and soothing headaches. 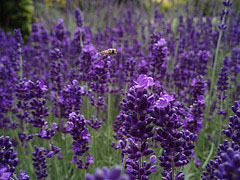 Lavender grows well in full sun, well-drained soil. Lavender buds are the part of the plant used for tea. 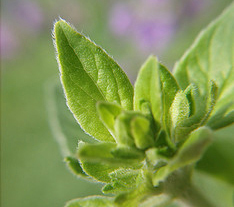 Bergamot - Bergamot, also known as beebalm, carries a touch of orange flavor. The plant produces gorgeous bright red, purple, or pink flowers and is happy in full sun or semi-shade. The leaves and flowers are suitable for steeping. Marjoram - this herb has a fruity, citrus flavor and an undertone of mint. It grows well in full sun to semi-shade. Leaves and flowers are suitable for steeping. to induce calm and sleep. It makes a gorgeous but delicate lawn feature with small daisy-like flowers. It tolerates full sun to semi-shade. The flowers are the preferred part for making the tea. with a fragrance reminiscent of summer time, jasmine provides a delicate and enticing flavor. It grows in full sun to semi-shade and although it can form a part of your tea garden, it needs a trellis or wall at the back of the garden to really thrive. It is not suitable for cold winter climates, however, so if you endure that sort of weather, you will need a potting arrangement that can be moved indoors. The flowers are the suitable part for making tea. Coriander (aka cilantro) - used more frequently in cooking, coriander is also suitable for herbal tea and has a flavor similar to Lady Grey tea. With strong citrus undertones, this tea carries a spicy and acidic flavor. Accepts full sun to semi-shade and is an ideal container herb. The leaves are used for tea. Thyme - thyme is considered to be a good tea for soothing stomach troubles and sore throats. It is spicy and may be an acquired taste - try it first before cutting too much herb! It is tolerant of full sun and semi-shade and is an ideal container herb. Use the leaves for tea - if flowers are present, these can also be added. Violets - if you love the smell of violets, violet tea will probably be a favorite with you. Violets prefer shady growing areas and are easy potted plants if desired. An excellent source of vitamins A and C. Violets are considered to be soothing and refreshing and are a good tonic after winter. The dried leaves and flowers are suitable for steeping (fresh flowers can be used for effect - see photo). Rosemary - Rosemary has long been used in infusions for easing emotional depression and blood circulation issues. This plant prefers strong full sun but will tolerate light shade, and requires well-drained soil. Follow the growing instructions for each plant. Keep the tea garden weed-free and use a compost tea or other natural source of nutrients to nourish it. Use a container version of the tea garden, or create a garden kit. Plant or include seeds of herbs and flowers of choice and arrange well. If you know which teas your gift recipient will like the most, then choose those. Write a small card detailing the properties of the tea garden. List the herbs and flowers, their growing needs, their health benefits and how to make fresh tea. Attach this to the container. Wrap in clear cellophane. Provided that the container will not be sitting around in hot sun for too long, you can present your gift wrapped in clear cellophane with a large ribbon bow for a special touch. If using live plants, make sure that the container has been well watered and is not leaking before wrapping. Prepare the leaves. Leaves should be bruised to release their essential oils. Do this by rubbing them together. Rugosa roses form excellent rose hips. If desired, you can dry your herbs. When using dried herbs, reduce the quantity of herbs by half to three-quarters of the amount of fresh herb you would use. Decorate your tea garden if desired to make it a special part of your garden. Experiment with iced tea versions - bergamot, peppermint and rose hips can make good iced herbal teas. Add sugar to mint tea for a truly refreshing taste in the style of Moroccan tea. Unless the beverage made uses the tea plant, Camellia sinensis, it is technically not a tea but an "herbal infusion." 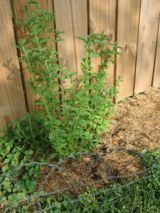 Lemon balm, (not to be confused with lemon verbena), and peppermint will take over the garden if given the opportunity. Keep them pot-bound if this is a concern for you. Do not use herbs or flowers that have pesticide residues. When growing, use natural pest reduction methods. If you obtain your leaves and flowers from elsewhere, know if pesticides were used before ingesting. If you are allergic to ragwort, it may be a good idea to avoid chamomile tea, as a similar allergic reaction can occur. Article provided by wikiHow, a wiki how-to manual. Please edit this article and find author credits at the original wikiHow article on How to Grow an Herbal Tea Garden. All content on wikiHow can be shared under a Creative Commons license.